As every business knows, having sufficient cash-flow is essential to making sure that your company is fully-functioning and running smoothly. Without having adequate cash-flow and working capital (the difference between your company’s current assets and current expenses) you put your business at risk of being unable to pay bills. One source of funding for companies in need of operating capital has been through the use of merchant cash advances. Over the past decade or so, with banks and conventional lenders exiting the small business lending space, a new type of alternative lender has stepped in to fill the void in business funding. Unlike with the more conventional lenders, a merchant cash advance lender can approve and fund a small business within a matter of days, if not hours. But, this type of fast funding comes with a price, as merchant cash advances have about the highest rates of all the business financing products available. On top of the extremely high rates, merchant cash advances can have substantial fees and very short-terms. In fact, the short-terms associated with merchant cash advances can put additional stress on a company’s cash flow. This is a reason why we recommend all small businesses resort to a cash advance as a last resort only. In this article we will look at the alternative financing options to cash advances. A merchant cash advances (sometimes referred to as a business cash advance, or a merchant loan) is the sale of a company’s future receivables at a discount to the small business funding company. To be clear, a merchant cash advance isn’t a loan at all. Since it involves the sale of the company’s future receivables, it is technically considered a business-to-business transaction. A cash advance’s approval and underwriting process is much different than you’d see from a more traditional lender, as a cash advance company only needs to run a basic credit check and analyze a few months of bank statements to make a decision and provide a financing offer. Once the offer is presented to the business, a cash advance company will then send them a contract to sign, along with some additional stipulations. After the contracts and signed and the stipulated documents are sent to the funder, the MCA company will then deposit funds into the company’s accounts, and begin the repayment process the next business day. Fast Funding: As mentioned, the best reason to obtain a merchant cash advance is because the approval process can be completed within a matter of hours (if not minutes) and then funds can be deposited into the company’s account within a day or two. Bad Credit OK: Unlike with a bank, a merchant cash advance funder will provide funding to businesses or business owners with a poor or bad credit history. In fact, merchant cash advance lenders can provide financing to business owners with credit scores as low as 500, and who may have personal or business tax liens. Access to Additional Funds: Once a small business has received a cash advance, the funding company will usually provide access to additional funds once the merchant has met a certain payback threshold (with most MCA lenders providing additional funds once the merchant has paid-back 50% of their advance). High rates: Quite simply a merchant cash advance has the highest rates of all types of business financing. A merchant cash advance isn’t calculated using an APR because its not a loan. Instead, the interest paid to a MCA lender is calculated using a factor rate (a multiple of how much the business will pay back on the loan including interest). A typical MCA can have factor rates than range from 1.10-1.50, which means if the MCA was for $10,000, the small business would pay back $10,000 X 1.10-1.50 (or $11,000-15,000). Short Terms: Not only do cash advances have the highest rates of all small business funding options, but the terms are extremely short in comparison to a bank or SBA loan. While many cash advance lenders will advertise their terms ranging up to 24 months, very few actually offer such long terms. A typical cash advance has a term of between 4-12 months. When the factor rate is calculated with such a short term, it means that the actual APR of a cash advance may be well over 100%. High Fees: As if the super-high rates weren’t bad enough, a cash advance lender may charge exorbitant fees to fund the merchant. While there are cash advance lenders that charge a simple $395 processing fee, there are other cash advance funders that may charge up to 10% of the total funding amount. Stress on Cash-Flow: Once a merchant is funded by the cash advance company, they are then expected to make daily payments to the lender either using an ACH payment method from a business’s bank accounts, or by splitting their merchant credit card processing sales with the funding company each day. These daily payments can put an enormous amount of stress on a company’s cash-flow leading to the business needing to obtain additional position cash advances. SBA Loans: Often the ideal type of financing for companies seeking low rates, long-terms and small fees, a SBA loan is a type of financing offered by conventional lenders who take advantage of the SBA loan guarantee enhancement. Such enhancement offers the lenders with the guarantee that if the borrower fails to repay their loan, the government will step in and cover much of the SBA lender’s losses. With rates starting at 6% and terms lasting up to 25 years, a SBA loan is the perfect alternative to a merchant cash advance. Bank Loans: Loans provided from a conventional bank are clearly the best financing option for a small business – and most businesses understand this. The issue isn’t the desire to get bank financing, the issue tends to be meeting the high requirements conventional lenders require. But, if you can meet their requirements, a conventional loan or line of credit is the ideal alternative to a merchant cash advance. Asset Based Loans: using your company’s assets on its balance sheet to obtain financing could be an ideal type of financing for companies that have had issues obtain conventional financing, have substantial asset value, and don’t want to get an unsecured merchant cash advance. By using your assets as collateral for financing, you are reducing the lender’s risk exposure, and thus: makes them more likely to lend at lower rates – which makes asset based lending a good alternative to a MCA. Private Investment Loans: this type of loan is provided by non-bank institutional lenders or investors looking for a return on their money by offering debt financing to growing small businesses, or businesses with substantial debt that would like to consolidate their cash advances into a single financing product. The longer terms and affordability of a private business loan make it a good alternative to a cash advance. Invoice Factoring: If your company has an outstanding 30-90 unpaid invoice from another business, you could sell that invoice to obtain access to immediate cash. In fact, with invoice factoring you could get funded for an invoice in as little as 24 hours. The speed of funding makes and affordability of factoring makes is a good alternative to a cash advance. Equipment Leasing: Rather than take an MCA in an emergency to replace business equipment, you could choose to instead lease the equipment at a much more affordable rate. With equipment leasing, the leasing company will purchase the equipment for the small business and then lease it to the small business for a period of time. Since the terms are much longer and involve monthly payments, equipment leasing may be the perfect alternative to a merchant cash advance. As you can see there are quite a few options that are both more affordable than a high-interest cash advance, but also provide much longer terms and lower fees than a MCA. Each of these types of business financing have their own criteria and requirements to get approved and complete funding. 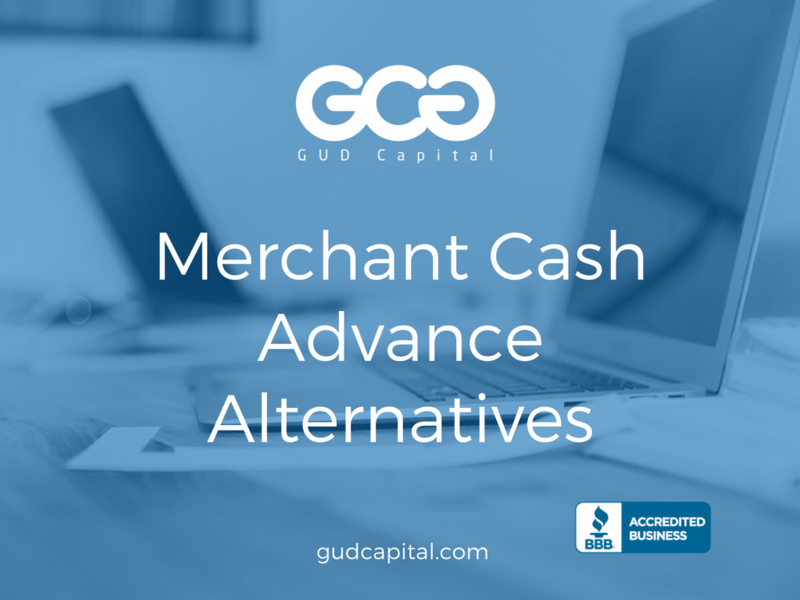 If you need help navigating the alternative options to merchant cash advances, please reach-out to our specialists, and they will explain all your options and help you get funded with the best option available.